In Tokyo exist many members of various people groups from around the planet. Just as in most major American cities, these various people groups exist in small pockets throughout the city. Of major notable areas are Yokohama Chinatown and Shin-Okubo. 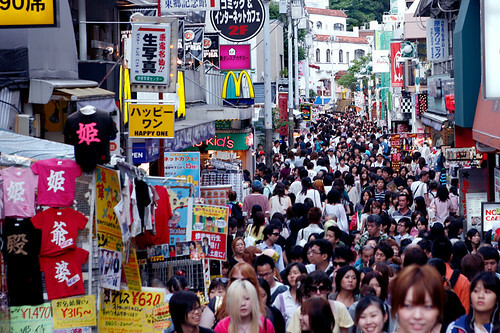 Chinese and Koreans are the largest people groups residing in Japan. In much smaller regards live many various peoples from Asia, Europe, and North America. In our time here in Tokyo we have noted that the common language seems to be English, as it is known to be the language of business worldwide. Though many Asian nations do not appear to be as free in regard to practice of religion as in Japan and South Korea, it should be noted that missionaries have great access to people groups from these more “hostile” countries from right inside Tokyo. In Japan there are nearly 700,000 Chinese people, but I wonder how many missionaries are working with them? Especially when it is much easier for a Westerner to come to Japan and work as opposed to China! But, of more interest has been our experiences in our very own language school learning Japanese. Katie and I have been able to speak with many different people from around Asia studying at this school, with a notable percent who have never heard anything about Christianity. For instance many Malaysian students speak English very well, have interest in Christianity, but have had little access to Christians as their country is relatively closed. In more recent times Katie has been ministering to Malaysian, Japanese, Chinese, and American people with interest in the gospel. Whereas I have been ministering with a Chinese and Malaysian man. All this is possible with our common bond of speaking the English language. Please pray for these people. Now consider your own city. How many different people groups exist in your home area? I recall in Missoula that the University had hundreds of people from all around the world. This was where I met my first two Japanese friends a few years ago as part of an international friendship program. For many international students meeting an American family who is Christian will be their very first exposure to Christianity. Seriously consider taking the time to look into your area for resources for contacting foreign visitors, it may be life changing.